Margaret Carpenter has heard “toi, toi, toi” a lot lately. She’s had some big-time good fortune as the result of her hard work in the School of Music, Theatre and Dance. This fall, she will be among 30 American students who will enter the University of Cambridge in England as 2011 Gates Cambridge Scholars. She is the first UNCG student to be selected for the award, which is funded by the Bill and Melinda Gates Foundation. A senior from Charlotte, Margaret will pursue a Master of Music degree in choral studies at the prestigious university, which is the second oldest in the English-speaking world. At Commencement on May 6, Margaret is expected to graduate with honors. 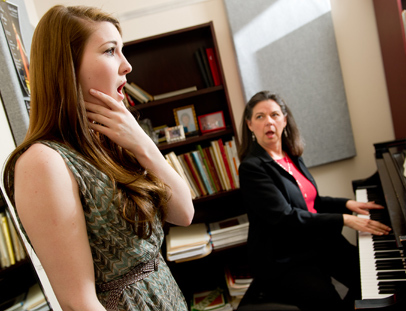 Along with her double major in voice performance and organ, she also has a concentration in choral conducting. Beyond her classes, she has been the assistant conductor of the Winston-Salem Symphony Chorale. She has held one of UNCG’s top scholarships as an Ethel Virginia Butler Merit Scholar. She has already studied in England, at Keele University last spring where she was a student conductor of the Keele Bach Choir and the Keele Philharmonic Orchestra and Choir. After graduation, she’s going back to Keele University to visit friends. This summer, she will perform with the Simon Carrington Singers in Kansas City, Mo., and at the Early Music America Young Performers Festival in Boston, Mass. The Gates award gives her a major boost toward her career goals of becoming choirmaster of a church and establishing or maintaining an existing choir school program. Margaret describes herself as a Type A personality who is focused and dedicated to her music studies. “I need something in front of me to work on,” she said. Her iPod is loaded with (as you’d expect) classical music, especially choral selections. She often listens to multiple settings of a single work by different choirs, looking for different elements in the music. In four years of study at UNCG, Margaret has had a wonderful experience with the music program, and faculty members praise her academic and musical skills. The love of the music that she wants to make pervades all that she does in study, practice and performance. Other Gates Cambridge Scholars come from UNC Chapel Hill, Wake Forest, Stanford, Princeton, Harvard, Massachusetts Institute of Technology, Yale and the Mayo Clinic College of Medicine – a field of 800 applicants that was narrowed down to 30. They will be joined by 60 international Gates Scholars, and all will study for Masters or PhD degrees. The Gates Cambridge Scholarship Program was created in 2000 to set up an international network of scholars and alumni who will have a transformative effect on society. Almost 1,000 students in more than 90 countries have been chosen for the program. So “toi, toi, toi,” then, Margaret.